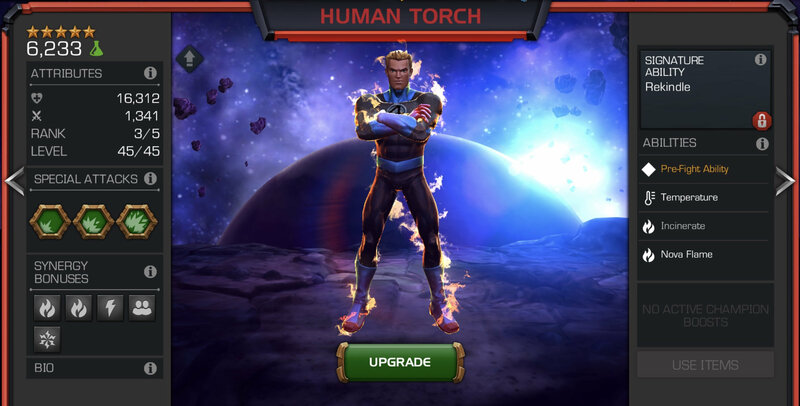 Is Human Torch gonna be a good option for war defense unblockable sp1? I have seen people dodging it rather easily but currently I’m at tier 8-12 so idk.. 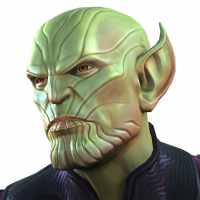 If not what do you guys think what should be the best node for him in AW? And is he even good for AWD in the first place? No IMO he is easy to beat. People have already learned how to evade his specials and how to avoid incinerate damage. Don't think he's the best option for AW defense. What nodes would you put him on? People have gotten TONS of practice fighting him due to the bounty missions. Thing is the better F4 defender. He is a good attacker though. depends, your best bet is to put him on a hidden node and hope someone brings in an energy based attacker. Beats any mystic champ outright. Keep that in mind. Yeah as far as I can tell it's literally impossible to solo him with a mystic champion. Yep everyone has had a lot of practice against him with the negative zone. I can dodge his sp1 fully if he launches sp1 at the moment I expect. If he launches it unexpectedly, can dodge the last 3 hits but I usually block the first hit because I cant react in time on my Android phone. Therefore, it can definitely still catch people off guard if human torch is on unblockable sp1 I think. He might have been a good defender had we not had to fight him 1000 times in these events. Most people have gotten enough practice in that they can evade both his specials consistently. The only way I see him getting kills is suprise bad matchups. 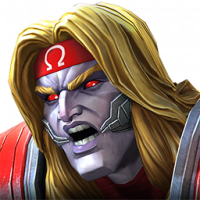 Champs that deal energy damage will take allot of unavoidable damage, and even incinerate immune champs will need to watch out for nova form (as he stops placing incinerates). Mystic champs will also be a auto loss in war, but let’s be honest, if you bring a mystic champ to fight a hidden science champ (aka you have class disadvantage) you deserve to lose. All of hits are projectiles, so based on how unblockable sp1 node works, not a single one of them should actually he unblockable. Ever fought unblockable sp1 Spider-Man? Notice how his sp1 the first 2 web shots can be blocked? That’s the same thing that’s happening with all 4 of HT sp1 hits.